Dear Meena, rest in peace! We will avenge your death by fearlessly continuing your honorable path! 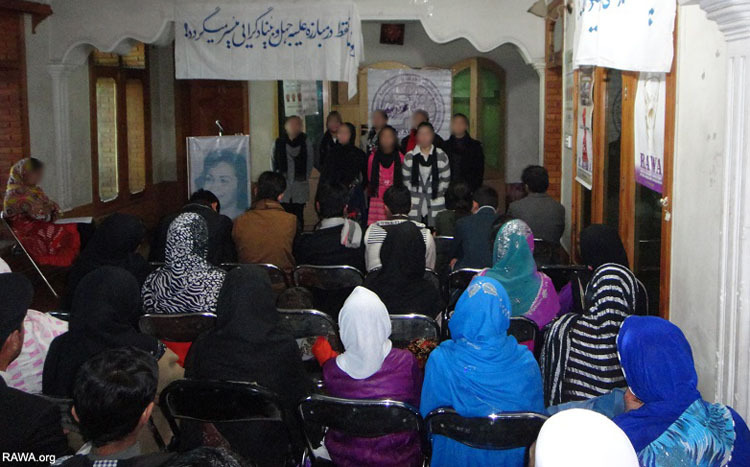 Twenty seven years back, on February 4, 1987, KHAD agents collaborated with the infamous criminals of Gulbuddin’s gang, and strangled Meena and her two accomplices to death and deprived Afghanistan and especially the Afghan women, of a wise leader. After her martyrdom, Meena’s followers inspired by this sacrifice at her young age, took a solemn oath to follow her path. 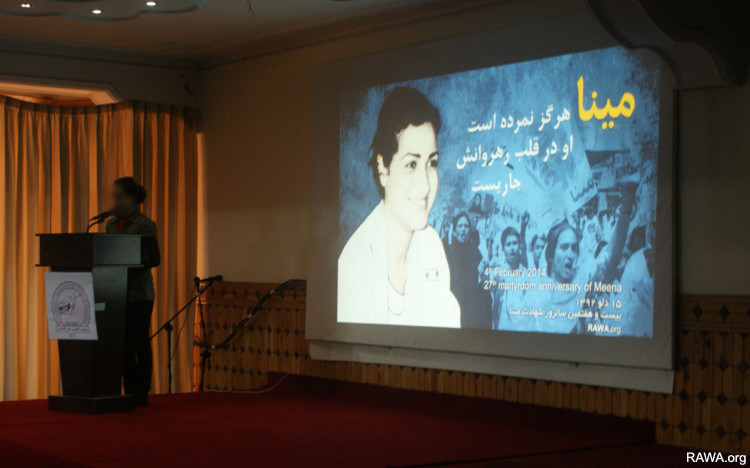 She was the first woman in Afghanistan who thought about creating an independent organization for women and in just the tender age of 23, established the Revolutionary Association of the Women of Afghanistan. She believed that Afghan women were one of the most oppressed sections of the society due to the heavy burden of poverty, widespread oppression and gender discrimination, and dominance of the horrifying feudal culture and patriarchy. 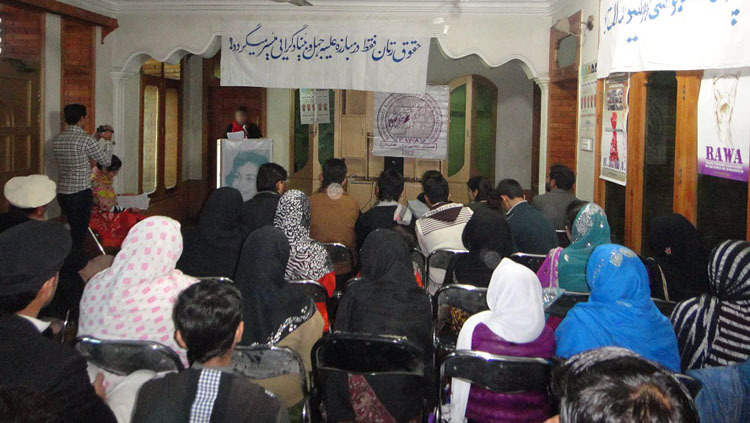 Therefore, they had a high capacity to gain revolutionary awareness and be practically involved in this struggle, and were capable of bringing about deep change in the society by playing a vital role. 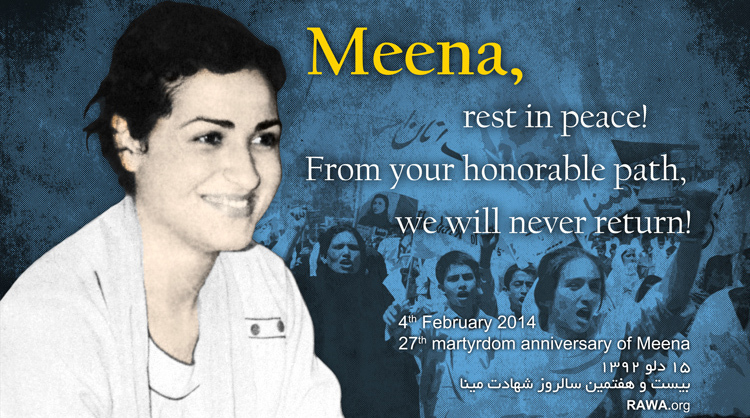 Meena was a woman who staunchly believed in revolutionary thoughts and actions. It was due to this unwavering belief that she passionately and firmly raised the banner of struggling against the two superpowers of that time, Russia with its Khalqi and Parchami stooges, and the fascist US with its fundamentalist mercenaries, and remained faithful to her cause till she was slain in cold blood. Although Meena loved her children and family deeply, she did not put anything above her political struggle. She was directly involved in the difficult and dangerous struggle with her personal life never being a hindrance to her activities, and she did not fall into the trap of extravagance or banality. She even left her education to pursue her political activities. 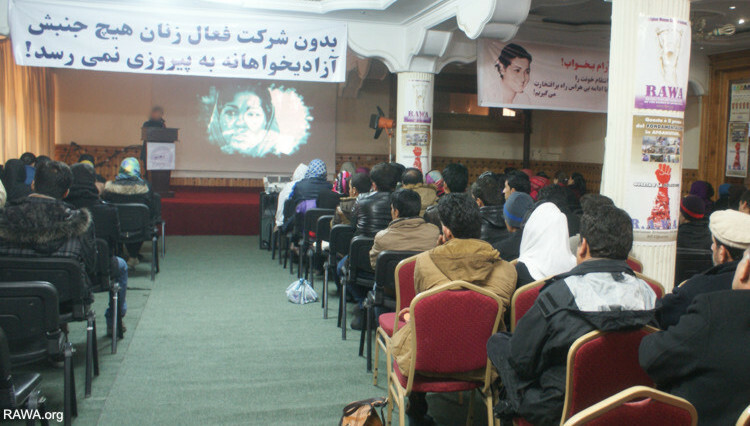 This is why today, Meena is one of the most successful women of Afghanistan’s history in her struggle and leadership. When Meena entered our home on the night of February 3rd at 9pm, we exchanged warm greetings. The pain of the loss of such a partner was very apparent on her face. Her words were filled with pain, but calm and firm. Her eyes did not tear till the end but her overwhelming grief could be easily seen on her face. Meena’s strength became clear when she spoke about the future duties and the difficult tasks at hand. Determined and firm she insisted on the need to continue fighting and taking revenge. 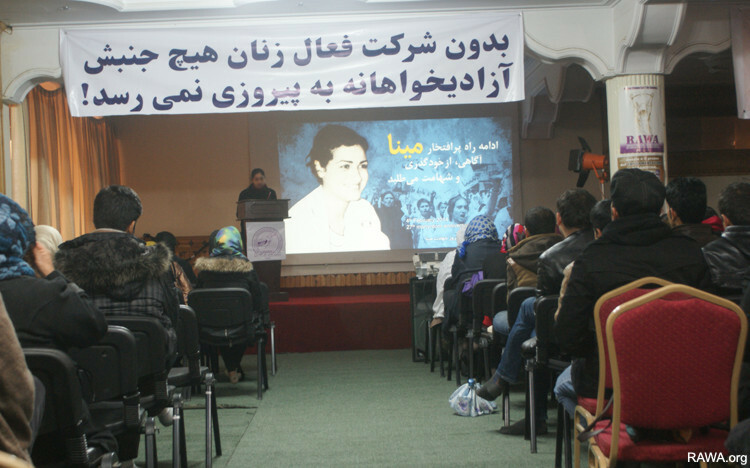 RAWA wants to truly achieve women’s rights in Afghanistan. We believe this is only possible with the struggle of women. The claims of women’s rights achievements in the past 12 years by the US occupiers and their puppet government, is another one of the many white lies told. How is it possible that women’s rights are secured by the most misogynist and traitorous men like Fahim, Qanooni, Sayyaf, Ismail, Atta, Abdullah, Mohaqiq, Khalili, and tens of other brutes who have been placed in Karzai’s puppet regime? A poem titled ‘Light of the People’ was declaimed by another member which praised Meena’s courage and perseverance. 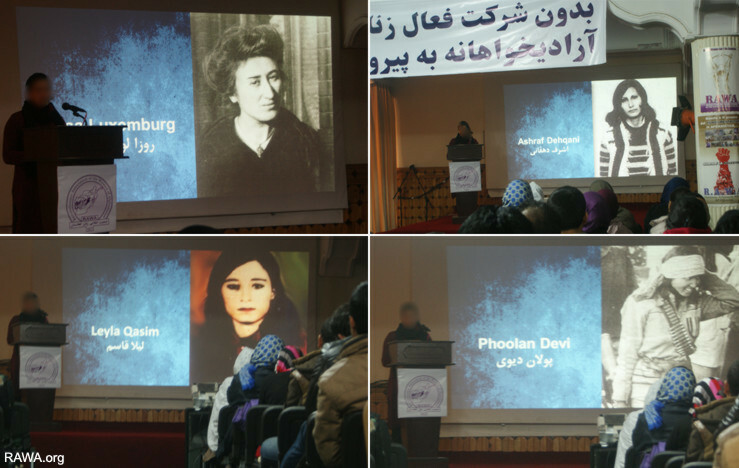 After this, the short biographies of four revolutionary women struggling for freedom (Rosa Luxemburg, Ashraf Dehqani, Leyla Qasim and Phoolan Devi) were read. They were described as an inspiration and example for women struggling all over the world. Dear friends, the suffering people of Iran have been living under the dominance of the most bloodthirsty apparatus in the world, Velayat-e faqih, for the past three decades. In this period, the fascist murderous Akhunds have butchered the noblest youth of the Iranian nation under torture in their Hitler-like slaughterhouses or hung them in their gallows. But despite all this, they have not been able to break the strong will and resistance of the heroes and freedom-fighters of Iran. The suffering people and revolutionary intellectuals of Iran, especially the youth, have sacrificed their lives, on roads and in prisons, in the struggle for the rights of their people, and for other humanitarian values. People Saeed Sultanpoor, Farzad Kamangar, Nida Sultani, Ali Haidarian, Farhad Wakili, Shireen Alamholi, Mehdi Islamian, and hundreds of other brave women and men have sacrificed their lives in legendary fashions, to keep the arduous path of strugglers like Bezhan Janazis, Khusrao Gulsurkhis, Samad Behrangis, Hameed Ashrafs, Amir Pervez Pouyans, Massoud Ahmadzadas, Marzia Iskoyees, breathing with life. In this part of our function, with unending respect to the struggle and resistance of the honorable Iranian people, we dedicate the poem ‘It’s Green Again’ by Hela Siddiqui, a young freedom-seeking poet, in her own voice. 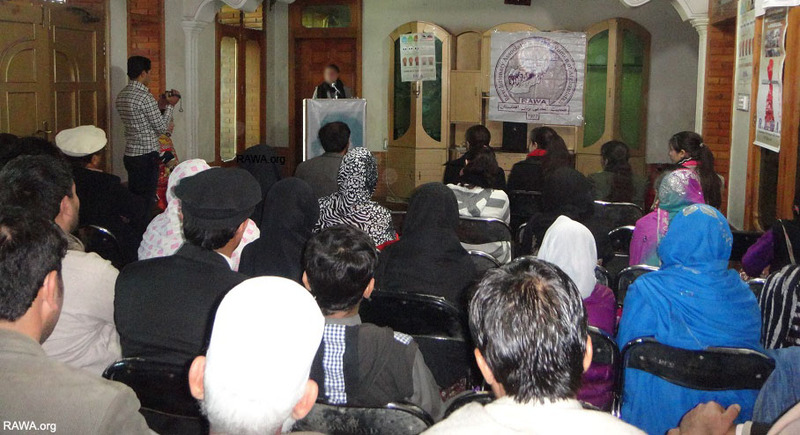 Sisters, this is only a glimpse of the US interference in Afghanistan’s elections. There are thousands of conspiracies which are unclear to us. But we all know that it is not possible to have free elections and for the people to choose their president in an occupied country where the US even controls the food and water. This is why majority of the Afghans say that the future president is chosen at the White House. The US and its western allies have ridiculed democracy in Afghanistan. Under the name of democracy and that anybody can run for elections, criminals who have the blood of thousands of Afghans running down their faces have joined this game. Most of the candidates and their deputies are Jehadi traitors and ISI and CIA spies whose bloody pasts are well known to our people. Imagine, if we had democracy or even quasi-democracy could killers of our people like Sayyaf, Abdullah, Dostum, Anwari, Zia Massoud, Gul Agha Sherzoy, Rahim Wardak, and others find their way into the candidates’ list? The function ended with another song sung by RAWA students called ‘Your path Guides Us’. 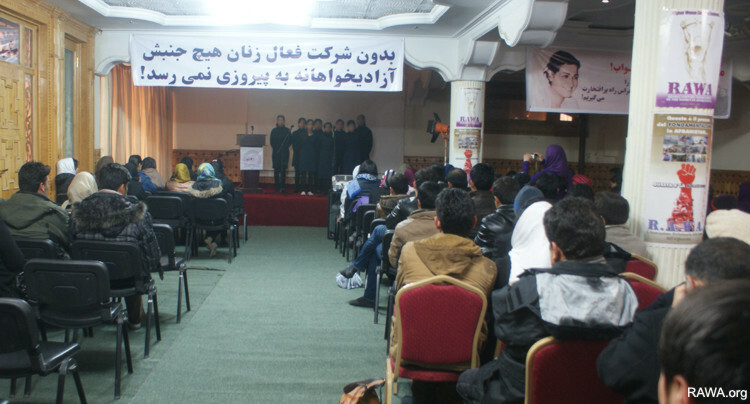 RAWA students singing a song about Meena on her 27th martyrdom anniversary.